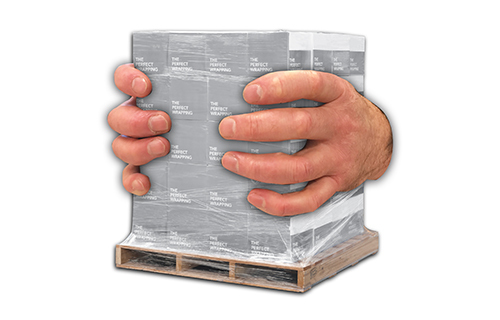 Do you hand stretch wrap your pallets correctly? Pallets are wrapped to contain and protect your goods during transit and storage. 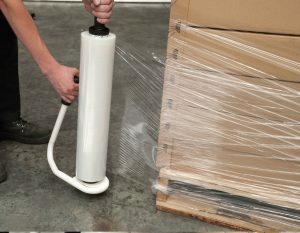 If the pallet is wrapped incorrectly, it will have poor load containment and will increase the risk of product damage. It’s vital to ensure that the pallets are wrapped properly so that there is no risk to the load. The containment force should be consistent around the top, middle and bottom of the pallet. 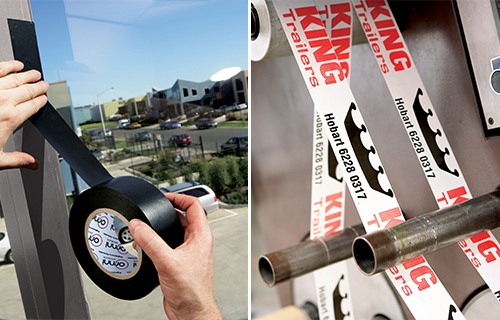 Make sure the stretch wrap is tight by using a dispenser to apply the film. 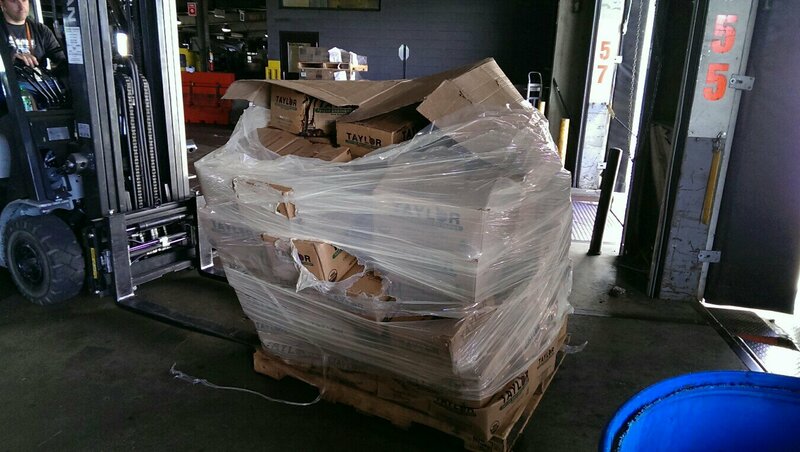 Did you know over 50% of damage is due to ineffective pallet wrapping? Wrapping pallets correctly is particularly difficult when manually hand wrapping. 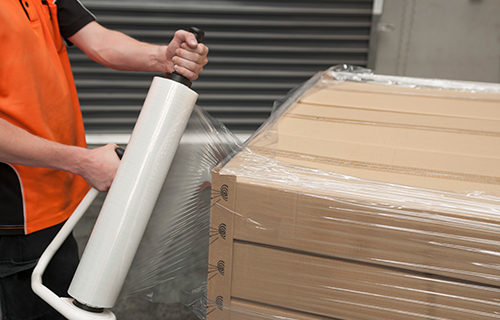 Many see wrapping pallets as an easy alternative to buying a pallet wrapping machine. This is a false economy. The truth is a pallet wrapping machine will potentially pay for itself in through savings on labour costs, stretch film and product damage. 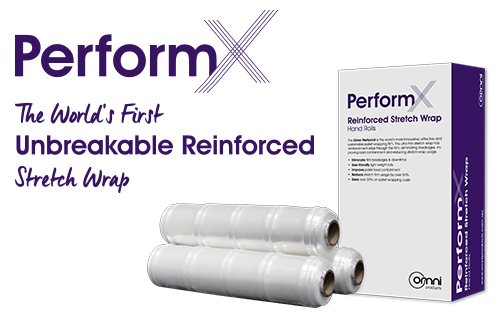 • Inconsistent containment force – It’s easier for people to wrap tightly in the middle of a load than the top and the bottom, leaving weak points. • A poor load-to-pallet bond – It’s difficult for people to reach the bottom of the load and catch the pallet, and the film always seems to tear anyway. 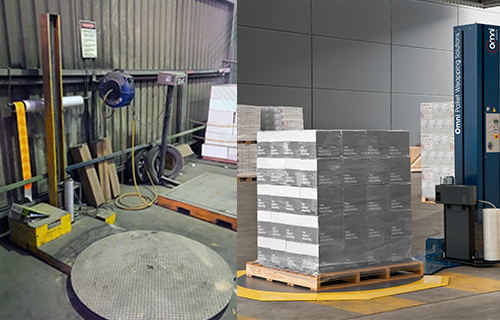 Without a proper load-to pallet bond you risk of the load sliding off its pallet during transit. 1. The pallet load should be stacked tightly, so that there is minimum space between the objects for any lateral movement. 2. The pallet should have optimum load stability and for that you should place the outer face of the film towards the product to be wrapped. 3. 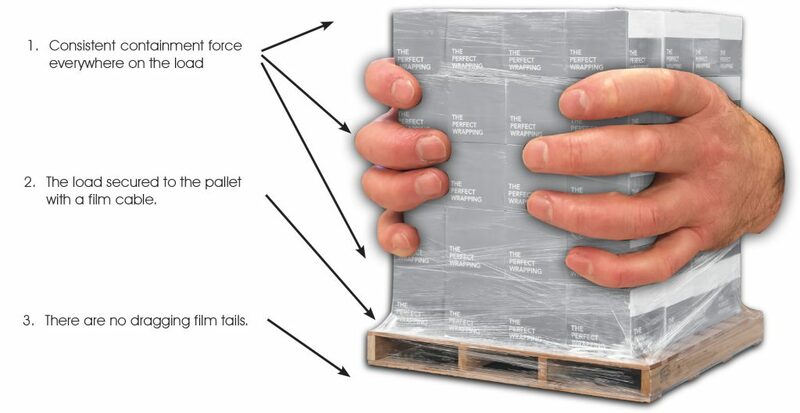 If the pallets are wrapped incorrectly with the outer face of the film away from the pallet, they will become prone to inter-pallet adhesion and loose tails. 4. Apply a minimum of three complete layers of film around the base of the pallet before moving upwards. 5. Stretch the film until there is an obvious resistance but do not overstretch it. Maintain a distance of approximately 300 mm away from the load as you walk around it. 6. 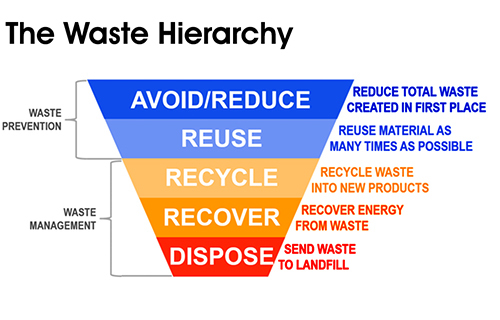 Continue to work upwards with a layer overlap of at least 25%. 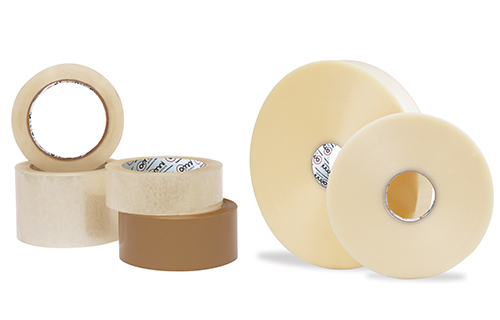 Wrapping the corners requires care as this is where the maximum stress is placed on the film. 7. Upon reaching the top of the pallet, secure the load with two complete layers. 8. Upon completing the final layer, cut the film off approximately 30 cm from the corner of the pallet. 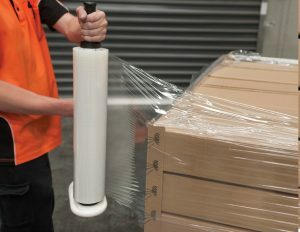 To finish off, smooth down the film tail by pressing it gently to the pallet. The end of the film should be tied to the corner of the pallet with a simple knot. 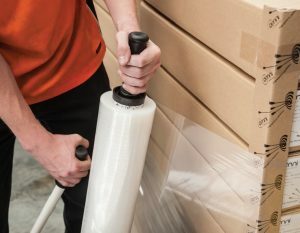 How long does it take you to hand stretch wrap a pallet? Save labour costs with a pallet wrapping machine! 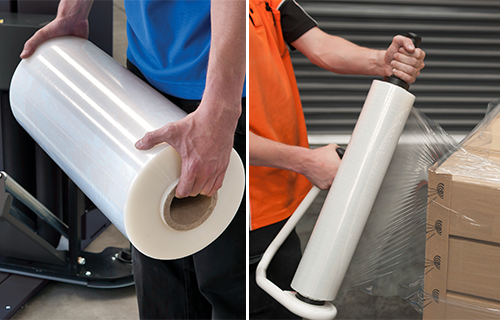 It is not just the unnecessary labour costs of manual wrapping that is costing you money. More importantly, it is the high risk of back injury which can cost businesses thousands of dollars in workplace injury claims. 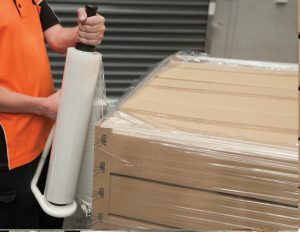 Wrapping pallets by hand results in poor postures and repetitive bending movements which can cause your staff to have musculoskeletal injuries. 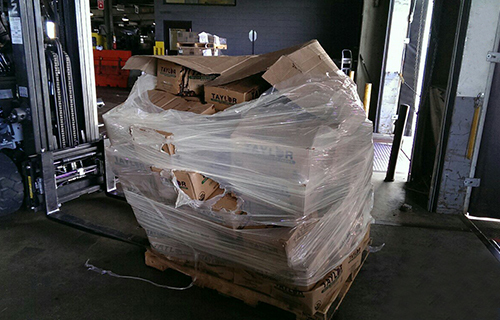 Worksafe Australia highly recommends wrapping pallets with a machine to reduce these risks. 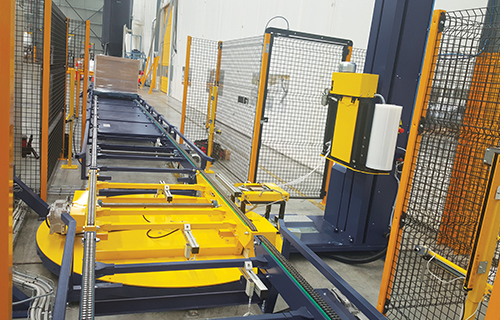 Enquire about our FREE pallet wrapping machine rental offer today!